Ginny receives a package from her Aunt Peg that contains 13 little blue envelopes, some money and the instruction to buy a plane ticket to London. Ginny knows if she does this something strange and exciting will happen, it just has to because Peg was fun and quirky and prone to odd things like running away across the world. The problem is that Peg is dead and can’t explain why she ran away. So Ginny, following her Aunt’s instructions sets of for London. Once there she can open the next envelope and follow those instructions. This is how Ginny sets out on an unexpected journey in the footsteps of her aunt. Along the way she meets people who knew Peg, and is challenged to do things outside her comfort zone. In the process of trying to do as her aunt asked she meets an artistic Londoner, an Italian boy with less than pure intentions, a regimented tourist family and some laid back Aussie backpackers, and she gets to see some of the most amazing parts of the world. The real treasure though is discovering her aunt in a whole new way. This story is a wonderful adventure of discovery, not only of Peg but also self-discovery for Ginny. Throughout the course of this journey Ginny comes out of her shell and really starts to grow as a person. The trip her aunt sends her on is a fascinating one that takes her off the beaten track at times. Ginny herself pulls you into the story as you care more about her journey that the aunt’s, not just the physical trip but also the emotional one. Johnson takes the reader to some fantastic places around the world and imbues each place with a vitality of its own. The supporting cast are fascinating and each bring a little something special to the story. 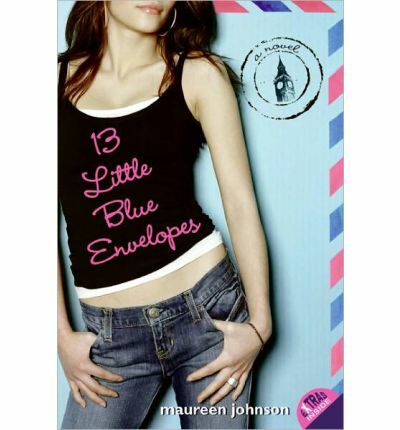 13 Little Blue Envelopes is an enjoyable read, though at times I did wonder about an aunt that would throw someone so inexperienced into some of those situations but then that is why this is fiction not reality. A pleasant way to escape for a while.